best professional organizers in Houston. Author Jill Jarvis contacted me to share about my business. What does a professional organizer do? Isn’t it my job to keep my things in order? If I live in the space and have survived 15 years in my own home, why would I hire someone to help organize it? Well, it turns out that a trained professional organizer can actually provide the one thing I am always searching for–order. A professional organizer would take these spaces and put them in order. Instead of just shoving towels in the closet, they would implement systems to help us keep things organized on a day-to-day basis. More than this, a professional organizer can specialize in helping people stage homes, prepare for moves and in interior decorating. Hearing this got me, the very organized person, thinking about hiring a professional organizer. So I asked my community of BigKidSmallCity readers for their favorite organizers in Houston. I am grateful to be the first on the list! Thank you Jill for honoring me! Being a mom or dad is a tough job. Being an ADHD parent requires more. Keeping your home organized and beautiful, your children on track with school and well behaved, and prioritizing your own well being are a lot for those with executive function challenges. Here are some tips to rock your parenting job. It’s all too much sometimes with all the clothes, toys, electronics and stuff. It’s hard to get control of stuff in your home. Having less to organize makes it easier to find homes for your stuff. Minimize the clutter by bringing in as little as you can. Be sure it’s something you must acquire before you purchase it. Assign a function to each room in your home so that you know what belongs in that space. At times the most difficult task in an ADHD home is where does something belong. It belongs in the space it is going to be used. If you already have too much, set aside an hour once a week to let go of what is unused currently. Declutter decisively by deciding if you have used it in the last 6 months. If not, be brutal and bring it to a donation spot that afternoon. You may have one regret for every 10 bags of donations, but it’s a small price to pay for clarity and organization in your home. Paper is a major enemy for ADHD parents. There’s too much coming in from the mail and school. Here’s a simple plan that helps. Open your mail over the recycling bin every day. Keep only what is required not potential papers such as service providers, coupons, or any other just in case papers. Pay bills online through your bank. Place the bills in a box marked for the year. Set up a command center for your kids’ papers. Drop in papers regularly and once a month talk about the papers with your kids. Discretely let go of what’s not “precious.” Move these remaining papers to a portfolio or make a photo book. Our busy families have lots of commitments. Keep track of them with a family calendar. A paper month at a glance calendar can hang by the refrigerator. Keep a basket or bulletin board for invitations, directions or other date related papers. Try online calendars like Google or Cozi to keep dates digitally, but print a copy for posting in your home. Remember to pencil in white space. Back to back commitments make life stressed. Down time gives everyone time to recuperate and refresh. It also gives you time to prioritize and evaluate. It’s easy to be late because of lost keys, homework, shoes or other last minute stuff. 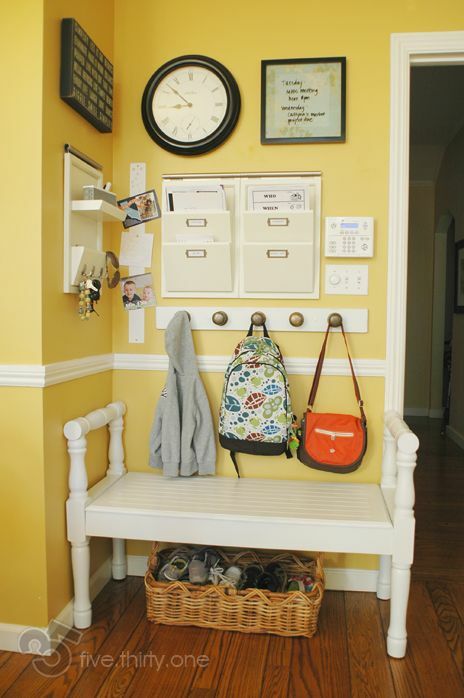 Create a landing strip at your door with hooks, baskets, a bench and a analog clock. It’s a spot to drop items as you come and go from the house. The most organized and productive ADHD parents recognize the value of a good night’s rest. With all these great tips in place, making sure you get to bed earlier than you think will help you rock being an ADHD parent. It’s a bright sunny day today but I am seeing all sorts of snow day fun in the news. Our last official snow occurred in December 2008. Since the chance of this precipitation rarely occurs here, it makes me think about having a self proclaimed snow day. A snow day for kids means a day of fun and no school. How refreshing that would be to be able to have an adult snow day! Things I would love to do on a snow day include staying in jammies all day, treating myself to hot cocoa, watch food tv favorites and reading endless numbers of magazines. Others might see a snow day as a day for improvised productivity. Yes, you could organize a closet, your email or your desk. Yes, you could get more done on this day. For me it would be a day filled with rejuvenation, renewal and reflection. According to The Energy Project, “we are at our best when we alternate between expending energy and intermittently renewing our four core energy needs: physical, emotional, mental, and spiritual. When you’re intent on supplying fuel in each dimension of energy, you’re creating happier people that will affect your organization’s success.” There’s power in renewal. When can I plan a snow day? It’s a day to put on the calendar! It may not be as spontaneous as the weather, but you can arrange it as a day to rejuvenate. We all need a day to be able to wind down, sit quietly and gain back our clarity. When is your snow day? Let’s plan it together! Life is filled with choices. Here’s a list of the upcoming January events recently shared by Sallie Alefson. There’s so many to celebrate! Is there a way to choose which holidays to celebrate? How will I prioritize? While each and every one of these events has merit, how do we choose which to celebrate? I could rely on personal or business connections to an event. I focus on organizing and productivity, so I could choose the events related to my work. Or I could choose which I think is most fun. There are lots of celebrations with laughter and joy. Another option is to rely on my priorities for the 2017. Each year I have a word of the year. Last year was Accept, 2015 was 15, 2014 was Thrive. My word for the year could help me prioritize. Whatever your way of prioritizing, we know there will always be more choices than we can imagine. I can’t celebrate each holiday, but I can prioritize the 3 that best fit my priorities this year. How do I stay true to those priorities? First, you may be overwhelmed and instantly think all are equally important. Give yourself a moment to process either with others, by writing, by speaking or just thinking. Each of us has a strength to rely on to make this decision. There are also tools we can use. Use a tournament method to whittle down the possibilities, weighing just one option against just one other option. Give each option a number value of 1,2, or 3. Decide the return on investment with finances. All of these strategies have value. Make your priorities stick by creating a reminder resource. That’s a way to keep your priorities upper most. A reminder resource can be tucked away on Notes or Evernote in your smartphone, a vision board in your closet, or choosing your word for the year. It’s not easy staying on target with your priorities and reminders help. January is the National Association of Professional Organizer’s Get Organized Month! 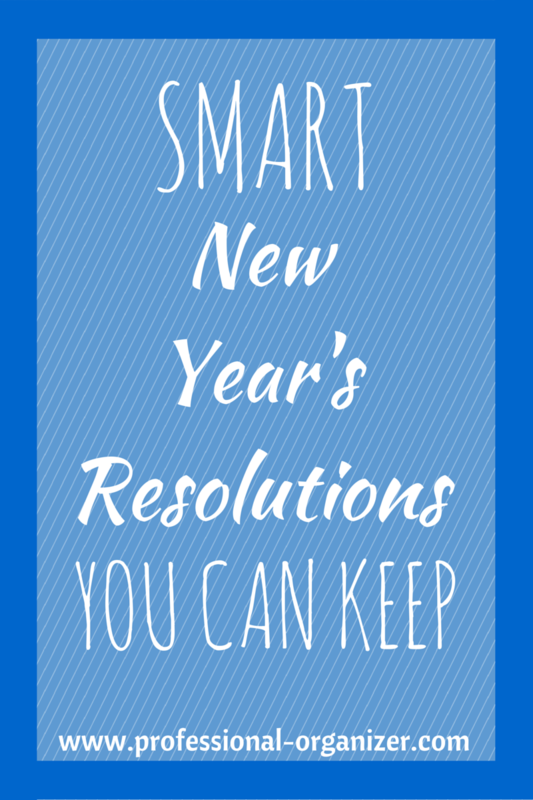 Organizing now ranks as the top new year’s resolution, more important that losing weight. Each year we are challenged to use our time most effectively and efficiently. With so much to get done, a calendar is essential. Your calendar is the visual guide for time management. Effective scheduling and productivity go hand in hand in getting accomplished what is most important. As with all organizing products, choosing the right calendar is critical. When you are deciding on a calendar, think of whether your view of your time is a daily, weekly or monthly time frame. Also, decide whether you are a tech person. Would you prefer a personal digital assistant (PDA)? These are especially useful to carry in a small bag, excellent to retain contact information, remind you of recurring events and synchronize with your computer. Or are you a paper person and would prefer a paper calendar? If you prefer writing in your appointments, carrying something a little larger, and enjoy writing in pencil, the paper calendar is good for you. 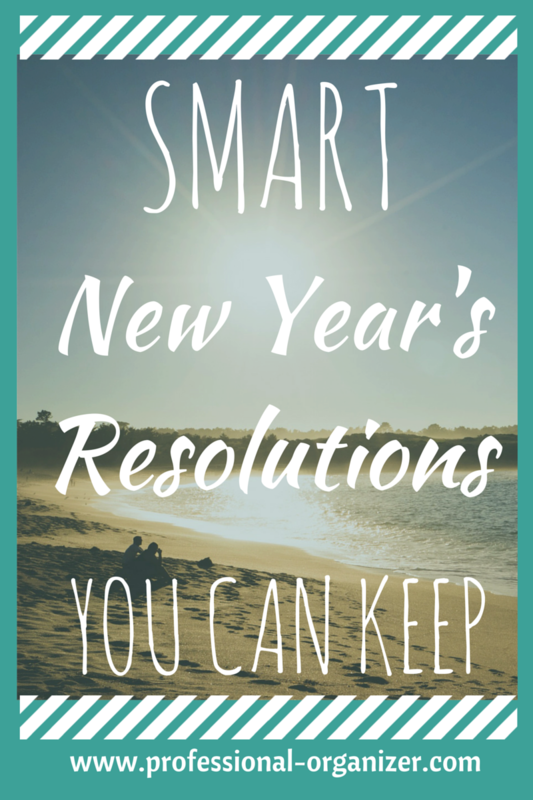 January is the best time to make the transition! Consistency is the key to your calendar. Write in all you and your family’s tasks, errands, invitations, appointments as well as any other important information in your calendar or planner. Your calendar is also a way to help organize your time to reflect your priorities. Think about your true priorities and then calendar them in. Not only will you be true to yourself on what is important, your planning will make these tasks easy to accomplish. Make appointments with yourself to follow through with specific tasks by a specific time and insure your accountability to yourself. Keeping one calendar makes all the difference in clarifying your activities. Only one calendar makes reviewing, entering and keeping information easy for you! For a paper calendar, using a pencil makes your calendar and list easy to read, less messy, more complete, and easy to change. Choose a pencil you love – either mechanical or with a good thick lead. And rely on a good eraser! For those with the PDA, remember to charge the batteries consistently so it is ready to use at all times. Also, learn the graffiti component to add information readily. Again, “Life Happens!” Be prepared for changes and flex your flexibility! Plan your time commitments to your best advantage. Many times our stress is due to time commitments we cannot control! Be prepared by having a little extra time between tasks, appointments and meetings. Take care in scheduling appointments and luncheons, being sure that your commitments have ample time between them. And then, just in case, add 15 minutes between major activities and appointments. A philosophy of adding a few extra minutes adds to your sense of balance throughout the day! With planning, you are ready to schedule activities and events to your advantage! Schedule similar events together to use your time most effectively. Group your errands for groceries, post office, or purchases by proximity, and schedule these sequentially on the same day. Make and return phone calls at a designated time. When you consolidate these activities, you save time and you accomplish the tasks most efficiently. Most importantly rely on your calendar by referring to it regularly! Review your calendar the evening before and in the morning to be sure you are keeping on task. Set aside a weekly planning time at the beginning of the week for you to incorporate your “to do list” and your calendar. You can plan best by having a time to do your paper work as well as schedule errands, grocery shopping and other weekly activities this way. Set an “appointment with yourself” to plan your time wisely and schedule paperwork. Time is our most precious commodity! Let’s honor our priorities by honoring what is most meaningful, affirming our priorities and finding balance in our life by using time wisely. Scheduling can make all the difference in our lives and our family’s lives too! Some of us are creatures of great routine and some of us are not. When it’s hard to make habits stick, it’s easy to get discouraged. We label ourselves as unable to create or stick with habits. With ADHD, it’s especially hard to create and stick to habits or routines. Habits are not always about being more disciplined. Habits are about finding ways to incorporate small changes that add up. 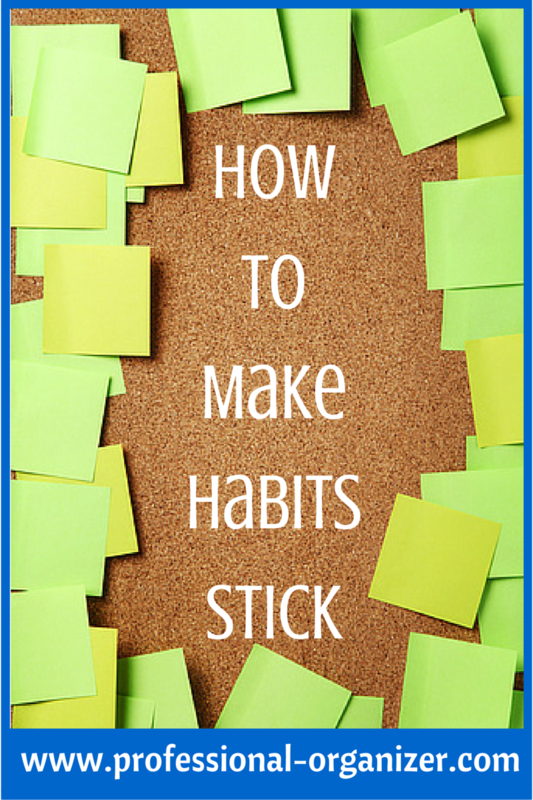 How do you make habits stick? Here are 5 ways to make habits more consistent in your life. Surprisingly most people don’t know what habits are sticking. Start with that awareness. Do you consistently do any one thing? It can be something so small you don’t recognize it. It can be a personal hygiene routine like brushing your teeth, a family activity like attending church or a time topic like being on time routinely. Once you know one habit is working, it’s a great way to start a new habit. Over and over we hear it takes 21 days to create a new habit. Research shows it is actually longer. However, often we are trying to tackle more than one habit at a time. Start with something small and specific that you can accomplish. Find one small part of a new habit you want to create and work just on that small piece. 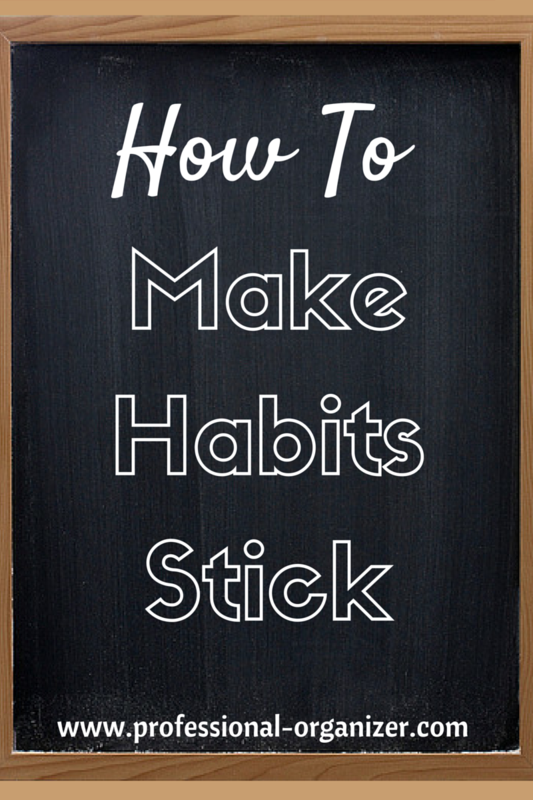 Now that you know about a successful habit, it’s time to hook onto this. This means you are doing this new habit just after your existing habit. This way you have the bonus of starting off with success. It’s a powerful way to see change. There’s no time like the present. As Nike says, “Just Do It.” Starting today means you are committing to change. End procrastination by saying that today is the day. Start right now. There are two sides to creating new habits, both procrastination and perfectionism. We give ourselves the option to just start tomorrow and procrastinate. We give ourselves permission to call it quits because we haven’t done the task perfectly day in and day out. Acknowledge both of these and be committed for a 3 month time. Be accountable with data with apps that help. Announce your intention to your best friend and have them support you in a loving way. Create a chart you check off daily to see progress. If you miss a day, get back on the wagon right away. How to make habits stick? Try just one of these tricks or tools for at least a month and see what happens! When there are tasks that need to be done over and over, a check list is a great way to get them completed. It’s also a sure way to know that a process or series of tasks gets done too. Check lists are reminders of what needs to be done when. Gathered from a group of professional organizers and productivity consultants, as well as other contributors, try out one of these check lists to make life easier! Share your favorite check lists here! https://professional-organizer.com/WordPress/wp-content/uploads/2016/07/logo.png 0 0 Ellen https://professional-organizer.com/WordPress/wp-content/uploads/2016/07/logo.png Ellen2016-01-05 06:00:322016-01-05 20:27:24Check Lists I Love!